About six months ago, the Globe and Mail‘s Christie Blatchford filed a series of courthouse dispatches from Hamilton, ON regarding the case of a Caledonia, ON family and their $7 million lawsuit against the Ontario government for failing to protect them from “the natives” (of Six Nations) as a result of the Caledonia land conflict. With column titles like “A reign of terror, a trail of OPP inaction,” “In Caledonia the weak finally have a voice against the strong,” and “A couple terrorized in a ‘war zone’ while police stood by,” Blatchford bludgeoned readers with hyperbole and sensationalism. Her pieces pitted faceless native thugs against a decent, law-abiding, salt-of-the-earth Canadian couple. 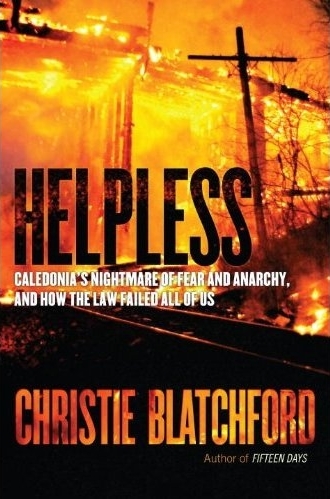 This fall, Blatchford turned those articles into a book with the correspondingly obnoxious title, Helpless: Caledonia’s Nightmare of Fear and Anarchy and How the Law Failed All of Us. I haven’t read Helpless, but if it’s anything like her Globe articles, I already know the story: savages circle the wagons while innocent homesteaders valiantly fight against overwhelming odds when, at the last minute, the cavalry arrives to vanquish the heathen warriors. But in this case, they don’t show up (or so Blatchford claims) and the noble frontiersmen and women suffer all manner of horrors at the hands of their terrorizers. But this week a group of students at the University of Waterloo decided to interrupt that narrative. They prevented Blatchford from speaking at a scheduled speech on campus, taking the stage and challenging the way she tells this story. The students asserted that the land dispute has been taken out of context by Blatchford’s book and that it fails to examine the history of the situation. And, in fact, Blatchford has admitted to looking at the conflict through “a very narrow prism.” Ultimately, the students felt that Blatchford should not have a forum to spread views they believe amount to racism. Indeed, the frustrating aspects of the articles that precipitated the book revolve around the endemic usage of “the natives” — some abstract and homogenous ‘others’ who are all inherently prone to violence — a conclusion arrived at without any in-depth examination of their actual motives. It seems Blatchford harbours an ongoing ignorance as to the perspectives of those Mohawk or Cayuga activists whom she indicts. But after the protest at the University of Waterloo, perhaps she can finally sympathize with them. I really wish I could agree with you. As a writer/journalist, I believe strongly in freedom of thought and expression. I think preventing Blatchford from delivering her speech was wrong on that basis alone. If she were going to make a fool of herself with half-baked ideas and twisted logic, then let her. Challenge what you feel is wrong, but let her speak just as you would demand to be heard in response.I haven’t read the book. I might. I found the Globe series one-sided but arguably with reason. The family that Blatchford followed in court presented one helluva story. Cut off, almost surrounded, subjected to enormous pressures. Their pleas for help, even to police, apparently ignored. Blatchford’s writing almost made me a believer – and I was there for part of it. But she doesn’t buy into the racist loonies (come on down, McHale’s Navy!) that represented the flip-side. Was she fair in her criticism of the OPP? Not entirely. Sure they didn’t stand with that family, the focus of Blatchford’s series in the Globe and (I believe) the basis for her book. But I think they genuinely tried to establish a neutral zone to keep two groups of people from possibly killing each other. Were there mistakes? Sure. Probably a lot more than I’m aware of. But in the end, Blatchford chose to stick with this family, caught in that not-so-neutral zone, to tell their story, of the failure of governments to honour centuries old legal agreements, to honestly deal with the situation, and to leave it to the OPP to try to play peacekeeper when they weren’t trained to do that type of job.I think everyone – all sides – have something to learn from what happened there. And Blatchford’s take deserves to be heard – even if you or I don’t agree with her or each other. Read it, listened to her rant on radio interviews. All I can say oh boo hoo to her. Some how she missed about 400 years of history where “the natives” were routinely burned out of their communities, slaughtered by masses, and excluded from any form of justice by then Canadian ‘authorities’. So now I’m suppose to be up in arms because a few white folk are feeling uneasy?!?! Unfortunately, her book is an unbalanced rant. Perhaps if she reversed all the references to the ‘victims’ (the whites) with ‘the natives’ (The First Nations) throughout her book it may be a little more balanced! Sorry but Christie quite clearly states what the book is about,not history but the unequal application of Canadian law. The Native terrorists should have been jailed, not someone who wanted to fly a Canadian flag. Regardless of past injustices, this is about the rule of law. It was ignored and applyed unequlaly. The people that illegally occupied and terrorized a town should have been arrested and in jail–period. The gov’t and the opp didn’t have the guts to put those responsilble in prison. They were terrorists plain ans simple, looking to cause trouble. And Yes the OPP are to blame for purposely ignoring those being assaulted and abused and NOT applying the law equally. As for the Waterloo protestor(s). may be she should read the book before interrupting “free speech”. All 6 protestor left during Christie’s 2nd visit and talk (before it was finished) because they were outside and it was cold. As long a Native terrorists (including those that come in from reserves outside of Canada wearing masks and advocating violence)intimidate innocent people, they will have a very difficult time gaining much sympathy. Authorities (OPP)continue ignore laws in this area (rollies-tabbaco). And Daniel, the book deals with much more than ‘a family’. It deals with the breakdown of law and the OPP ignoring assaults and intimidation that would happen right in front of them. “AS A JOURNALIST” that “hasn’t read the book” (like the UW protestor), maybe you should try to research or even read the facts(like most professional and experienced journalists do) before calling her half-baked. Well, you’ve made it quite clear which side of the evolutionary line you fall on. At least I was able to read the book and make a fair judgement rather than those,like yourself, that haven’t read it and are able to hide behind pseudo journalism and ignore the facts and use insults when challenged. Just your luck. I’m offline for the next little while, so have fun playing with yourself. Enjoy and have fun. No point in writing anymore since you seem unable and unwilling to engage in any mature and reasonable discussion and only insult those that disagree with your reaction to a book that you haven’t read.